This book offers a reassessment of the theology of F. D. Maurice (1805-72), one of the most significant theologians of the modern Church of England. 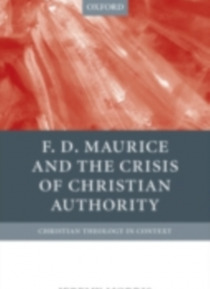 It seeks to place Maurice's theology in the context of nineteenth-century conflicts over the social role of the Church, and over the truth of the Christian revelation. Maurice is known today mostly for his seminal role in the formation of Christian … Socialism, and for his dismissal from his chair at King's College,London, over his denial of the doctrine of eternal punishment. Drawing on the whole range of Maurice's extensive published work, this book argues that his theology, and his social and educational activity, were held together above all by his commitment to a renewal of Anglican ecclesiology. At a timewhen, following the social upheavals of the French Revolution and the Industrial Revolution, many of his contemporaries feared that the authority of the Christian Church - and particularly of the Church of England - was under threat, Maurice sought to reinvigorate his Church's sense of mission by emphasizing its national responsibility, and its theological inclusiveness. In the process, he pioneered a new appreciation of the diversity of Christian traditions that was to be of great importancefor the Church of England's ecumenical commitment. He also sought to limit the damage of internal Church division, by promoting a view of the Church's comprehensiveness that acknowledged the complementary truth of convictions fiercely held by competing parties.